I thought I ought to finally break cover on my 1/24th (or Gn15 depending on what's running/who's looking) micro. This is in fact Mk2, Mk 1 was on a cardboard baseboard which despite proving it's concept (indeed it survived striping down), didn't work out as intended. A certain person suggested trying again and looking for something else I found my electrical bits box, a Ferrero Roche box left over from last Christmas. I would like to point out that my wife was the owner, not me, but I bought them with an eye on the box, a nice flat 12" by 6" ish container. 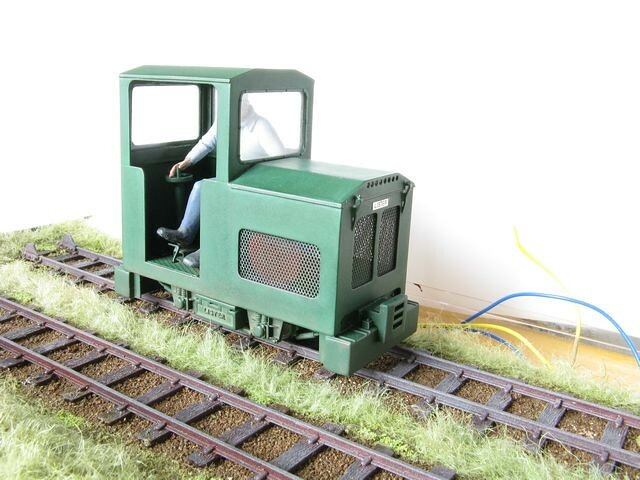 So here we are, the bottom of the box forms the scenic area, whilst the lid forms an oversize 'sector cassette' with room to store spare wagons, loads etc so they don't get in the way of the sliding action. The plastic container makes it easy to slide the two parts along each other. 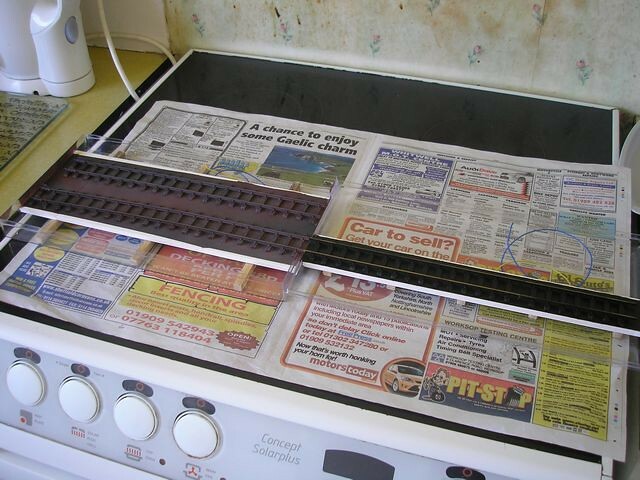 The outer rails on the scenic section have tabs on them to stop overslide and align the tracks accurately. I still need to wire everything together electrically but track feeds are in place. 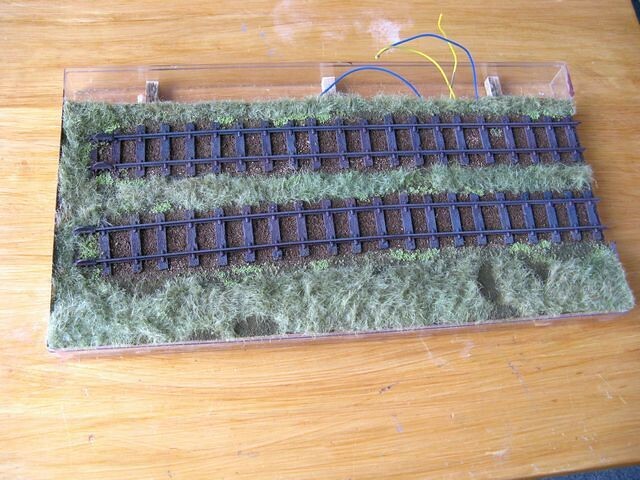 The trackbed is foamcore, raised on lengths of 7mm stripwood recovered from the streets after bonfire night. So now we know why the Ambasador serves Ferrero Roche*... to build micro layouts in the boxes...!! Last edited by Colin Peake on Mon Nov 10, 2008 9:16 am, edited 4 times in total. Colin, a question if you will - does the sector plate /traverser slide within the tray, or does the complete tray slide along against the "layout"? Looks good Colin, trouble is these things get your mind working over time. 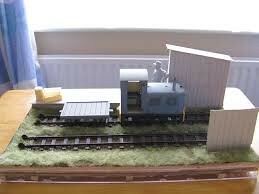 Could you tell me a little about the loco, make etc... as it looks fab. Ooooh, looks great now you have put the grass on there Colin. Now getting an idea of how it is going to shape up. It already makes a nice display piece on which to put your Lister. With the removeable backdrop/building, I suppose you could have several different settings, industrial, estate, agricultural, whatever takes your fancy really. Now you got me thinking, using the Ferrero Roche box with plug in cassettes, rather than using the top, could be two layouts from one box. 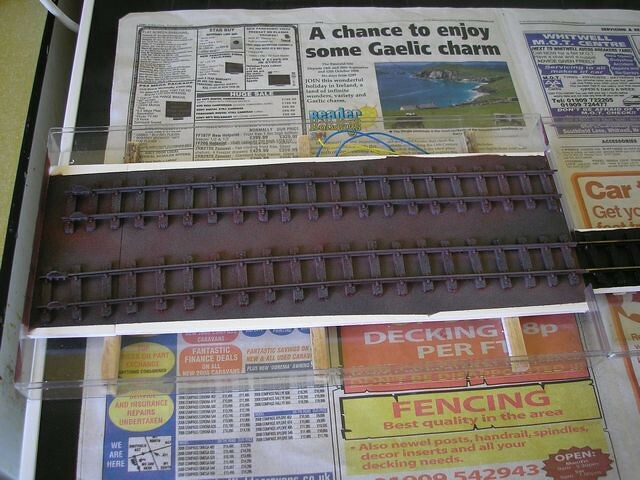 Or maybe even scenic both halves of the box and have them join for a 24" long layout. Oh hell, can see I will have to eat a box of chocolates maybe even more . The basket liner looks really good, Colin, I'm looking forward to see what you do with the backdrop. 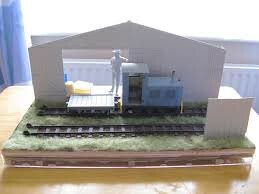 Will it be modelled, like a building, or a photo-backscene? monstermunch1982 wrote: Could you tell me a little about the loco, make etc... as it looks fab. Do you buy them in green colours, or do you have to spray it first? And what is the method of sticking it down? Do you pull it apart in chunks, and then glue to the layout, or do you glue down a big area and pull it away to get the standing up effect??? You have got a good standing up effect, much better than static grass in my onion. The particular product I use, from Wilkinson's hardware stores in the UK, is called 'Moss Effect Hanging Basket Liner' and comes ready coloured green. The shades vary a bit over the piece which is an advantage Now is often the time to get it before they wheel the gardening stuff out of the way to make way for Christmas stock (I'm not joking). Before use I usually brush the sheet over with a wire brush to bring some of the fibres up, and cut it into pieces the size I need, but usually 2" max in each dimension. I usually prepare the area by painting dark brown or adding earth coloured ground foam (depending on how fussy I am being). 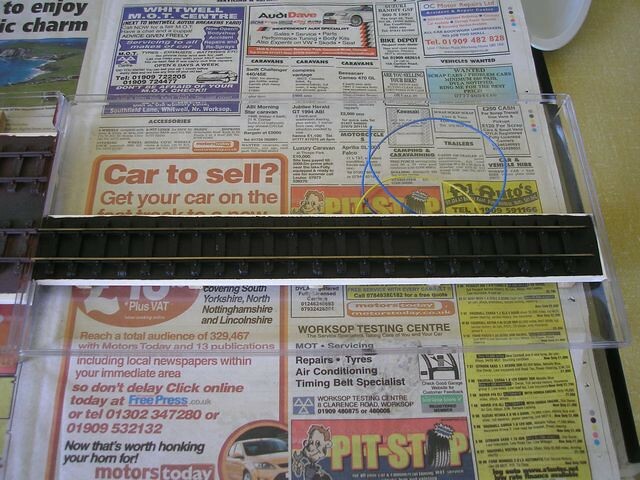 Then apply a coat of neat PVA and press down the pieces of liner, not too lightly but not too hard. After 3 hours the PVA is usually set enough to begin peeling off the upper layers and gradually removing excess to produce realistic looking grass. It can be trimmed using scissors or for mown effect a fresh disposable razor can be used. Thanks for that great description Colin. I have seen hanging baskets over here made of the natural brown colour. I will have to pay more attention now; although it is the middle of winter at the moment (snow down to 200meters today) so I suspect the range of those products available at this time of year will not be great. Anyway I am going to give this a try sometime, so Thanks. Great stuff. For some reason I am imagining bespoke Ferrero Roche-carrying wagons in the style of molten steel tubs. Steve Bennett wrote: Ooooh, looks great now you have put the grass on there Colin. Now getting an idea of how it is going to shape up. It already makes a nice display piece on which to put your Lister. With the removeable backdrop/building, I suppose you could have several different settings, industrial, estate, agricultural, whatever takes your fancy really. Well, after a break in Norfolk, I've finally got around to mocking up a couple of alternative ideas for buildings and scenarios. I must admit, I am now more tempted towards the industrial scene than estate, although I am useless at coming up with purposes for industrial lines!! Why not do both, or more and make them interchangeable dependent on your mood. Hmmmmm, I like both Colin, but it wont surprise you when I say the industrial one has the edge. As for what the industry is, does it matter . I couldnt decide when I built my little Vanguard Works, so took the easy option of just shuffling cardboard boxes around, with the works name on them. I have no idea what is inside them . Point taken re boxes, a useful dodge, how about 'Ambasador Works' ?! Colin Peake wrote: Point taken re boxes, a useful dodge, how about 'Ambasador Works' ?! This is very low resolution, will email a bitmap version if you want to use it. Fruitboxes laden with toms would be an attractive load. If you want a few tiny ones I still have the mould - come to think of it I still have some Mooli seeds left - make good plum tomatoes, though I say it myself. Both versions of scenery look good to me, but the loading dock is kind of persuasive. You could use the same branding for both: the ambassador's estate grows something, and the estate version is where they are brought from the fields to the railway: the loading shed is at the tradesman's entrance to the gardens, just by the glasshouses (out of view, left...) with a road at the rear where the produce is loaded onto a cart, steam-wagon or lorry depending on your preference - just stick a picture at the rear, the limitations on sight angles and a well positioned figure will take care of the perspective. Great concept Colin. 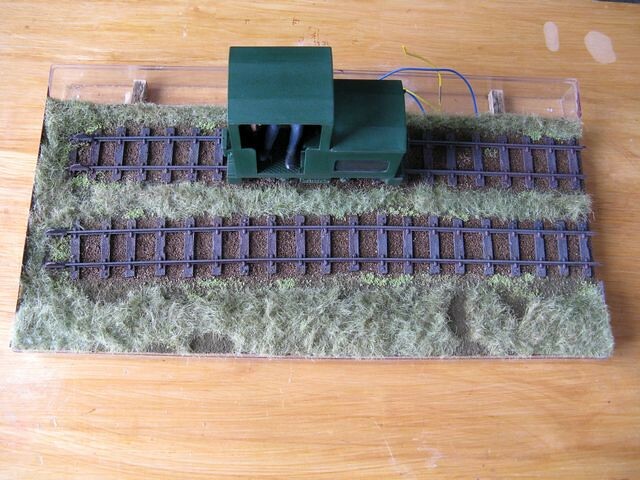 I like both the mock ups and am tempted to try something similar in a number of other scale / gauges, maybe using a video box as suggested by Bob Blackcloud.